Groundwater is the water contained within rocks and sediments below the ground's surface. While it usually remains below the soil, groundwater can be pumped to the surface from holes drilled in the ground, known as bores, wells or spear points. It can also be reached during excavation and sometimes comes to the surface on its own, flowing out as natural springs or seeps. Groundwater levels rise and fall in wet and dry times. What is the Botany Sands aquifer? The Botany Sands aquifer is a layer of sand beneath the Botany Bay area. A large amount of freshwater collects in and flows underground through the aquifer. Can I use water from the Botany Sands aquifer? Residents cannot use this groundwater for any domestic purpose, such as drinking, cooking, watering household gardens, washing cars and clothes, filling swimming pools and providing drinking water for animals. Chemicals in the water may have no colour or taste. The polluted water could look clean. The Botany Sands aquifer extends from Surry Hills to Tempe and to Botany Bay. While only a small proportion of the aquifer area is known to be polluted, the legacy of past land use activities could have affected the groundwater in many other parts of the aquifer. See the map of the specific locations where groundwater extraction is restricted. How do I know if I have groundwater or a bore in use on my property? WaterNSW and the NSW Department of Industry—Lands & Water (the department) have records of licensed bores around Botany Sands and are in contact with their owners about the restrictions. The majority of the bores in the restricted area are for water monitoring. There may also be some illegal and unapproved bores and spear points in the area. Bores and spear points are usually found outside in gardens or sheds. They may not be easily visible. The pump might be hidden by brickwork, wooden boxes or other external features. However, when you turn on a tap linked to a bore, you may hear the sound of pumping or water being drawn up from the ground. Properties using bore water might also display a ‘Bore water in use’ sign. Report the suspected use of groundwater for domestic purposes in the restricted area on 1800 633 362 or via nrar.enquiries@nrar.nsw.gov.au. Occasionally, deep holes dug for pools, building works and even plantings of large trees may intersect the shallow groundwater within the aquifer. If groundwater flows into a hole during excavation, it could be polluted. Take precautions to avoid contact with the groundwater and seek advice and relevant approvals from your local council before undertaking building works on your property. The map below shows the locations where the extraction of groundwater from the Botany Sands aquifer is restricted. How did the pollution occur? The Botany Bay area has been home to industry for over a century. Before modern environmental protections were in place, tanneries, metal platers, service stations and depots, landfills, dry cleaners, wool scourers and other businesses operated across Botany Sands. Contamination from activities that escaped or was spilled onto the ground is likely to have leached into the groundwater. The aquifer is particularly vulnerable to this kind of contamination because the sandy soil above it allows pollutants to pass through easily and the groundwater is often very close to the surface. As a result, chemicals such as chlorinated hydrocarbons and other solvents, petroleum hydrocarbons (such as petrol and diesel), and some heavy metals such as chromium, nickel, lead and arsenic, have polluted groundwater in parts of the aquifer. What is the NSW Government doing? NSW Government agencies are working together to manage the pollution across the Botany Sands area and possible health risks. Under NSW Environment Protection Authority regulation, Orica is leading a clean-up of the most heavily polluted groundwater. So far, more than 1,300 tonnes of contaminants have been removed from the water and destroyed. More information is available from Orica. 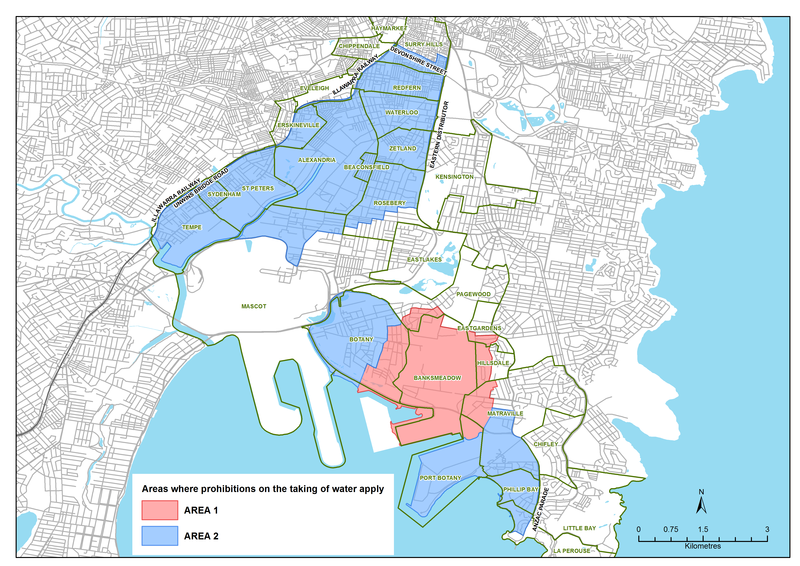 Additionally, since 2006, the NSW Government has restricted groundwater extraction in certain areas near Botany Bay through a temporary water restrictions order ((PDF 274.0 KB)). This is a precautionary approach to ensure public health is not put at risk from exposure to potentially polluted groundwater. The locations impacted by the order are marked on the map below (Areas 1 and 2). The areas have been identified due to the existence of historical pollution and the way groundwater flows underground. Domestic use of groundwater in Areas 1 and 2 is prohibited. Conditions are also in place for taking water for non-domestic uses and specified industrial water access licences. These restrictions minimise the risk to residents and stop polluted water from being drawn into new parts of the aquifer through widespread pumping. The current Temporary Water Restrictions Order under the Water Management Act 2000 replaces a similar order made in 2006. The department and WaterNSW have contacted licensed bore owners in the restricted area. All extraction of groundwater by residents for domestic purposes is prohibited in Area 1 and Area 2, shown on the map above. The restrictions apply to a whole land parcel, even if only part of the property is within the restricted area. More detailed maps of the restricted areas are available on request from WaterNSW on 1300 662 077. Holders of industrial groundwater extraction licences listed in the Order and those using water for non-domestic purposes in Area 1 and 2 must also comply with conditions and requirements. Report any suspected pollution incidents or water quality issues to the Environmental Protection Agency’s environment line on 131 555.